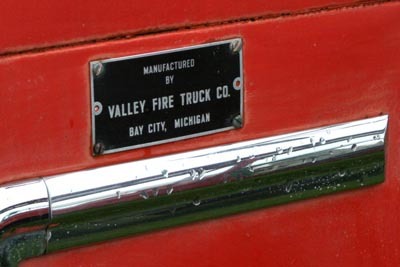 by Valley Fire Truck Co. 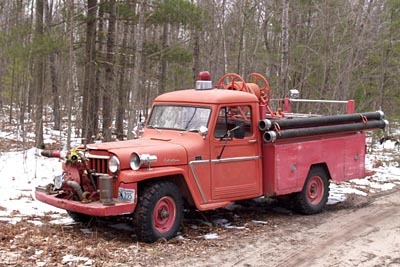 Some Willys fire trucks, particularly those built by Howe and General, were sold through Willys dealers as Willys "Commando" Fire Trucks. Other trucks released by the factory as pickups or "stripped chassis" trucks (see Willys-Overland Production Figures) were converted into fire engines by a number of apparatus manufacturers, using a variety of designs unique to their builders. 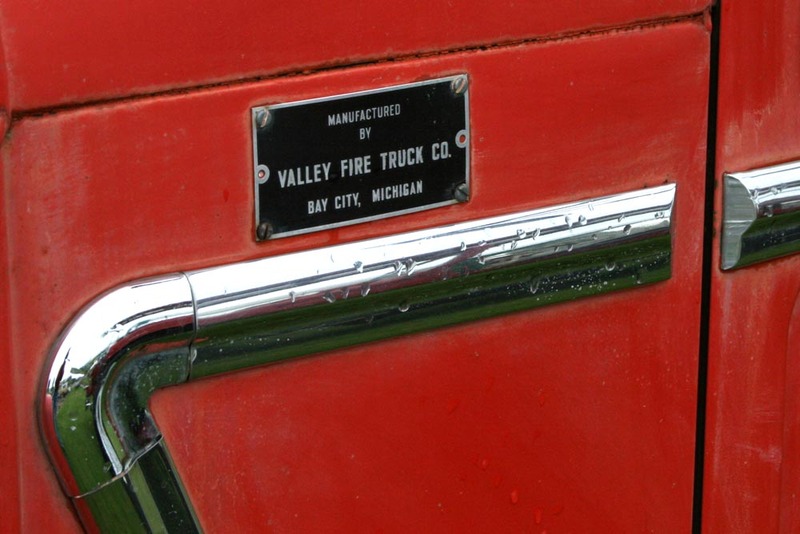 Valley Fire Truck in Bay City, Michigan built the "Champion" Willys, and marketed it directly to municipalities and industry. 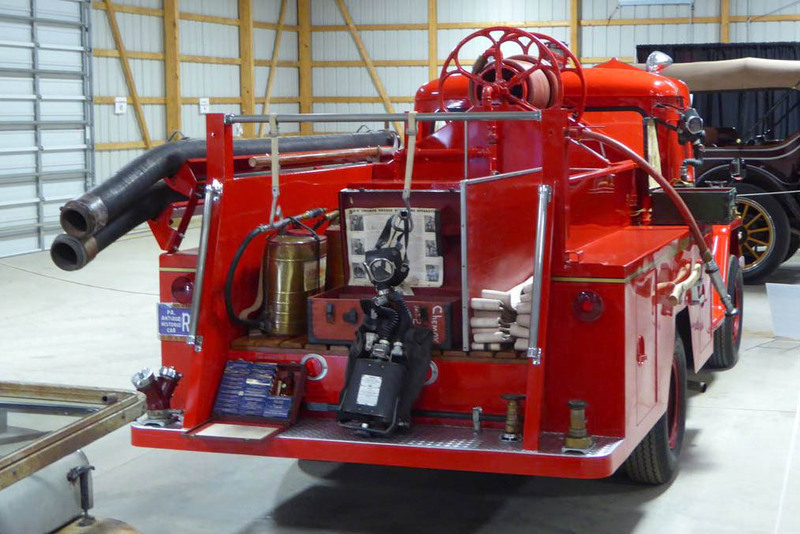 This pumper built by Valley Fire Truck in 1957 was restored by Bill Engeman of Wexford PA in 2016. 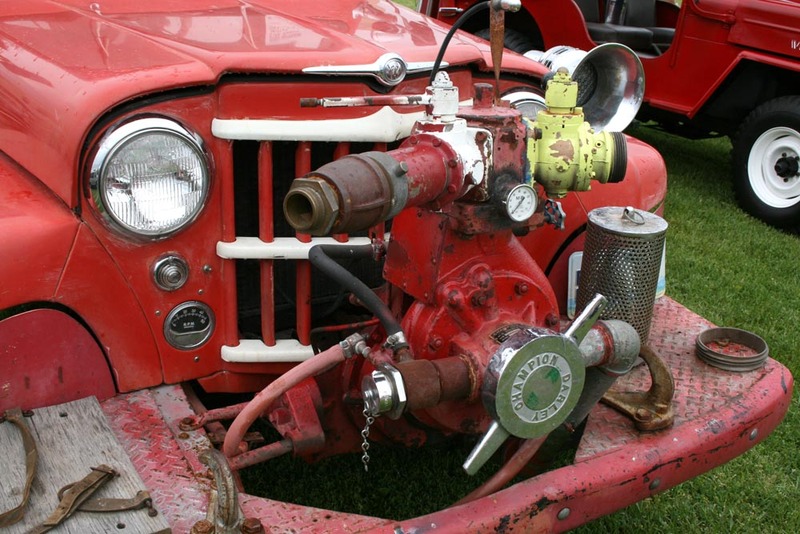 It was displayed at the 2016 Bantam Jeep Heritage Festival, and was then purchased for the Omix-ADA Jeep Collection. 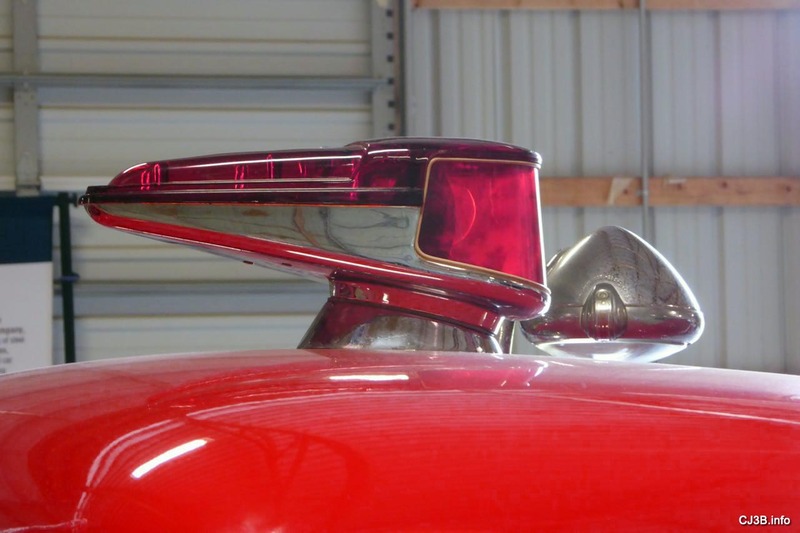 The truck's streamlined roof light (90K JPEG) was also used by General Fire Truck. Does anyone know the origin of this light? Bill's restoration includes an interesting collection of equipment (150K JPEG). The Champion was apparently in service with PPG Industries prior to being sold as surplus in 1992. Ron Hattner's truck is a 1962 Champion. Compared to the Commando, the Valley truck has larger rear compartments and lacks the "streamlined" bodywork behind the cab. It also has front fender skirts more neatly matched to the shape of the fenders than General's sheet metal or Howe's diamond plate versions. These photos were taken at the 2007 Spring Midwest Willys Reunion in Rochester Hills, Michigan, where the truck was also photographed at the Chrysler Museum. A closer shot of the Darley Champion pump (170K JPEG) shows the tachometer neatly mounted just below the switch for the pump operator's light. 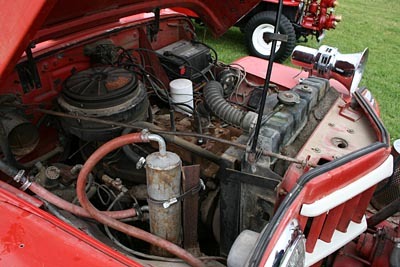 An auxiliary cooling unit is connected to water flowing through the front-mounted pump, allowing lengthy pump operation. 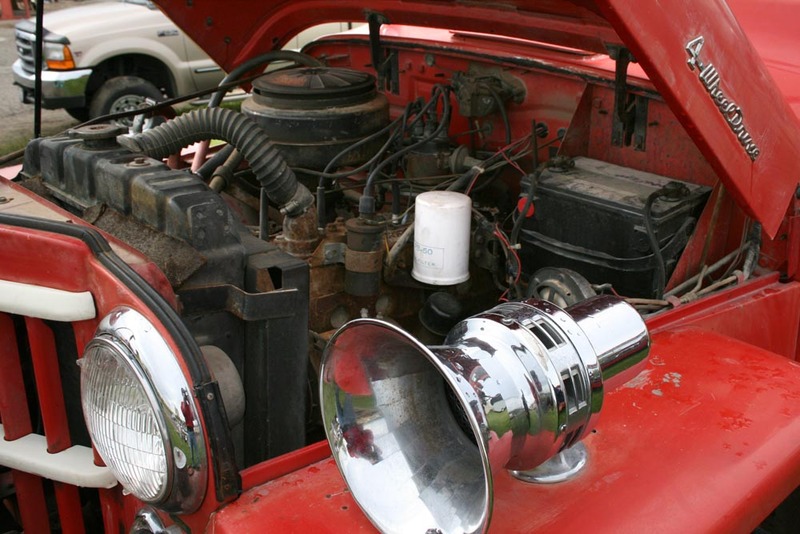 See also a closer view of the siren and left side of the engine (140K JPEG). 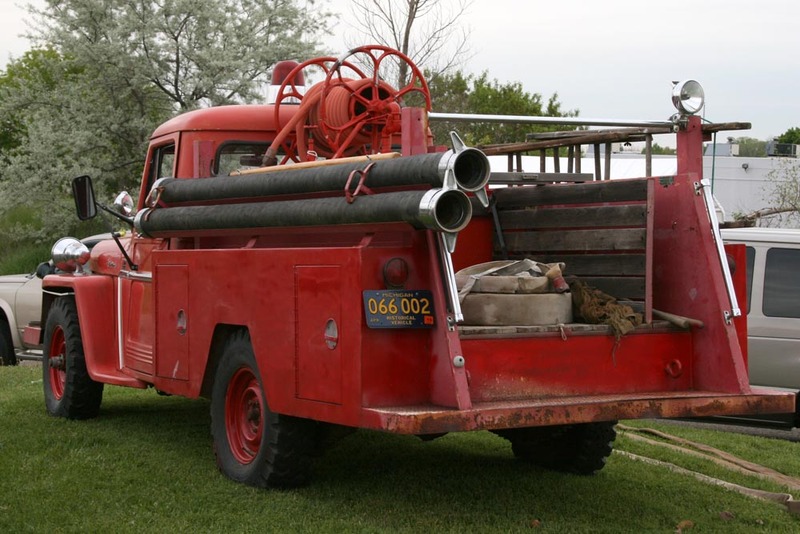 The truck was originally in service in Riverton, Wyoming. 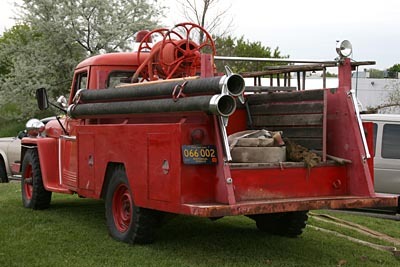 It has been sold several times since its retirement, and is now back in Michigan, at Ron Hattner's place where Bill Norris took this photo. 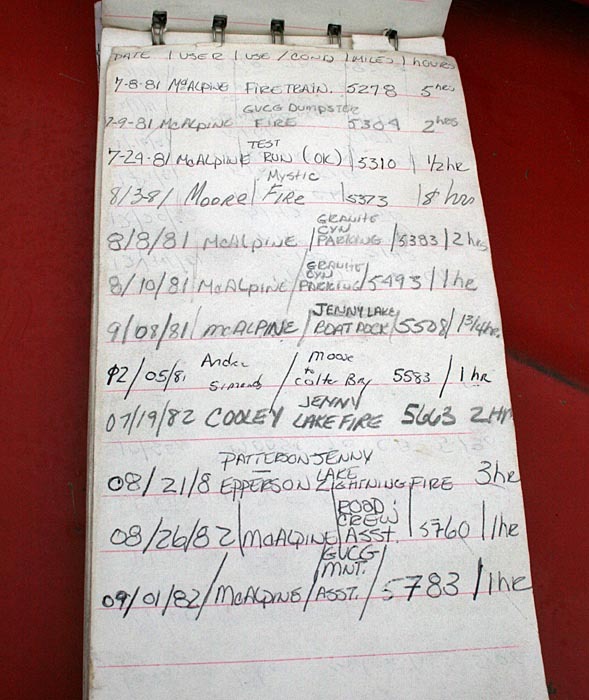 As this 1988 page from the Riverton log book shows, the 500 GPM Darley front mount pump once pumped 13 days straight, with the engine running at 2000 RPM, while fighting a major wildfire. 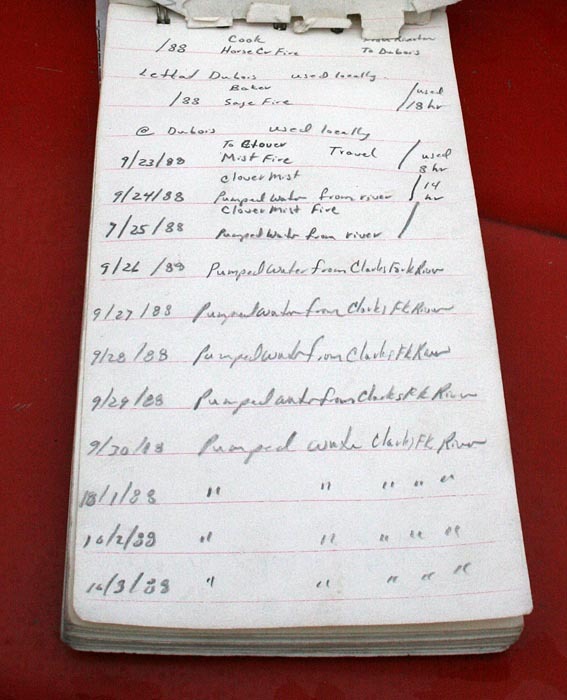 By contrast, a 1981 log page (110K JPEG) shows a more typical variety of training, tests and fire runs. 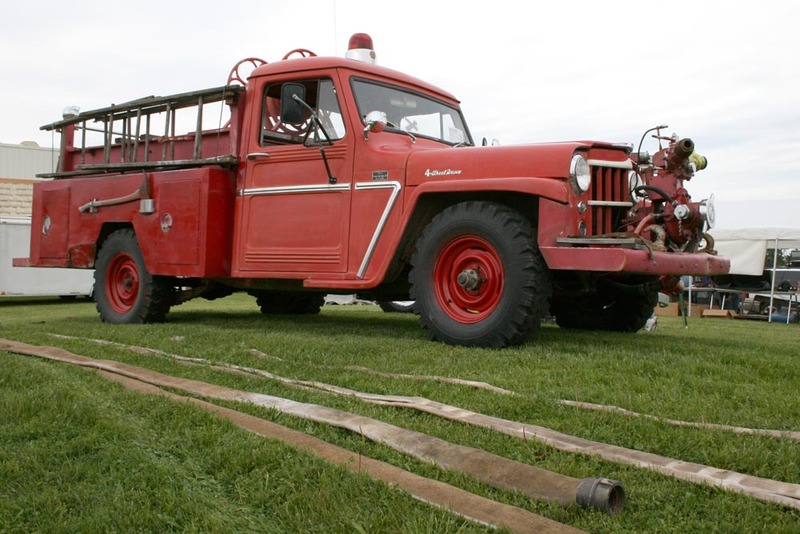 Incidentally, Riverton is also home to the Wyoming Fire Academy. The Valley builder's plate (right) is found on both sides of the cowl. 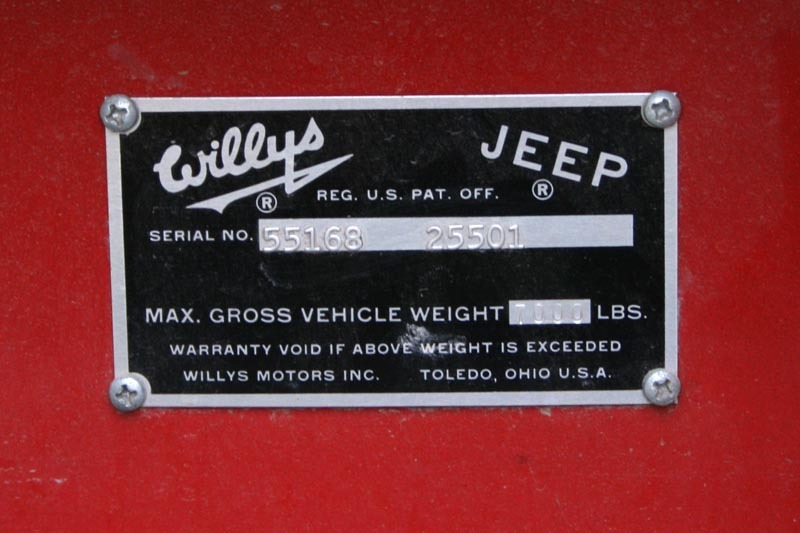 The Willys serial number plate (90K JPEG) with S.N. 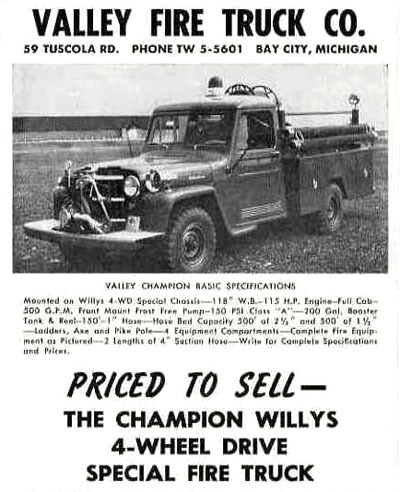 55168 25501 indicates the truck was produced by Willys as a cab and chassis with 6-226 engine in 1962, although it is currently titled as a 1959. The plate also includes the rated maximum GVW of 7000 pounds. 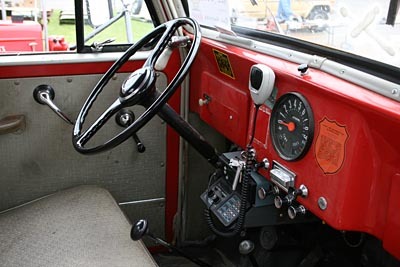 The cab shows very little modification besides the radio. The rear view shows the decorative booster reel (130K JPEG). The left rear compartment (120K JPEG) in front of the Hall taillight contains large hand pump extinguishers. 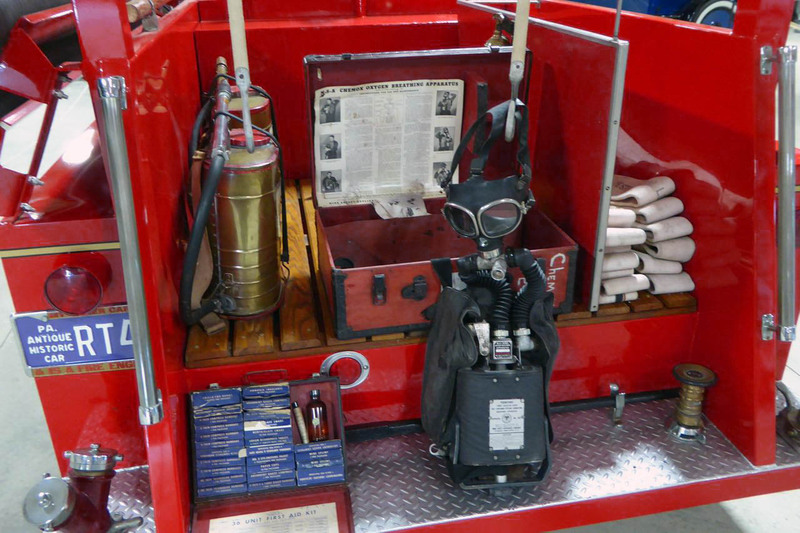 The left front compartment contains hose nozzles and a Civil Defense V777 Radiation Detection Set. 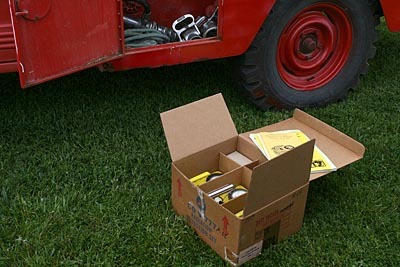 The box has a sticker on the side advising "For use in nuclear attack only", and records on the box indicate the set was inspected as recently as 1993. According to a Wikipedia entry on Civil Defense Geiger Counters, the 777 set included a CDV-700 Model No. 6A geiger counter and two CDV-715 Model No. 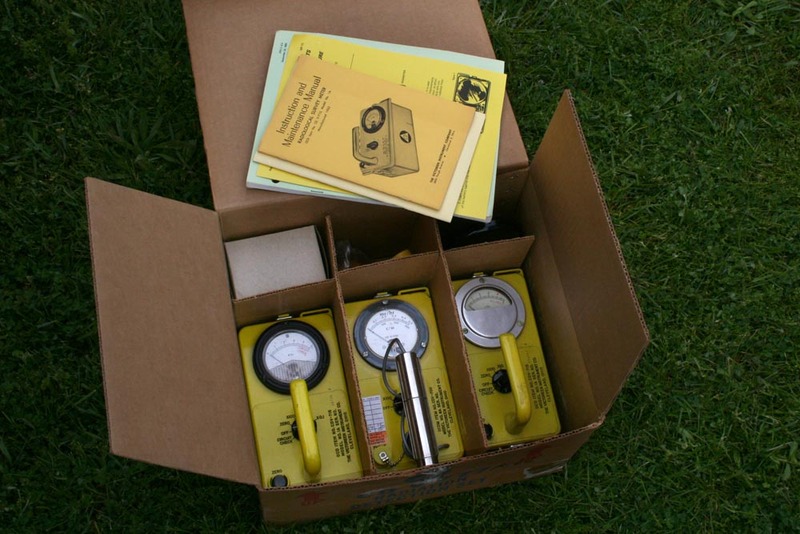 1A survey meters made by Victoreen, as well as dosimeters, headphones, carrying straps and instructions. The CDV-700 (center) is a geiger counter which detects low levels of beta radiation and gamma radiation. It must be used in conjunction with a survey meter (left and right) in high-radiation areas. High radiation fields can saturate the geiger tube, causing the meter to read a very low level of radiation and the user to believe it is safe when it is not. A bit of a radioactive isotope such as uranium is provided as a "check source" under a sticker on the side of the CDV-700. This produces about 100x the normal background level of radiation, and gives a reading which is clearly visible on the meter and audible via the headphones. The CDV-715 survey meters are specifically designed for high-radiation fields such as nuclear fallout, spent reactor fuel rods, or industrial radiography leakage. The radiation penetrates the case of the unit and the enclosed ionization chamber. The Civil Defense Radiation Detection Survey Meters, Geiger Counters and Dosimeters FAQ suggests "If you can get this unit to react to any source of radiation, evacuate the area immediately!" 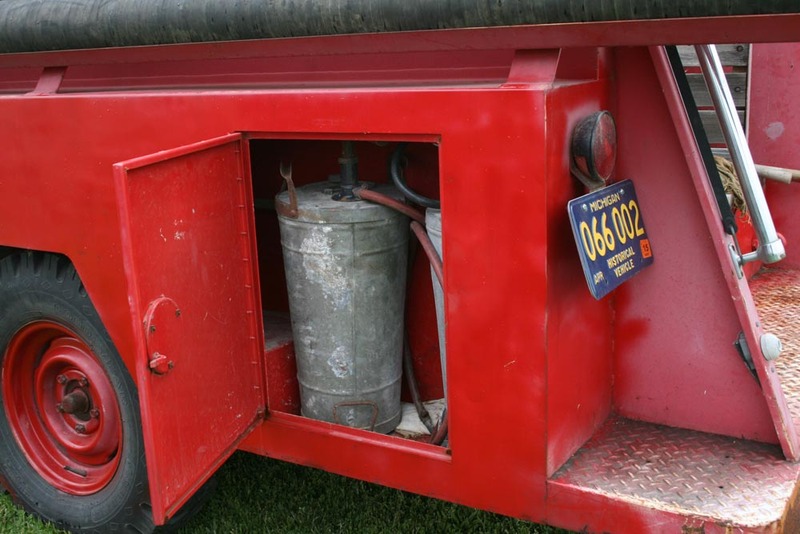 Although the Cold War which was at its height when this truck was originally built and equipped is now history, there is a renewed demand for radiation detection equipment. These old Civil Defense units currently sell for substantial prices, but they should be checked and calibrated before use. 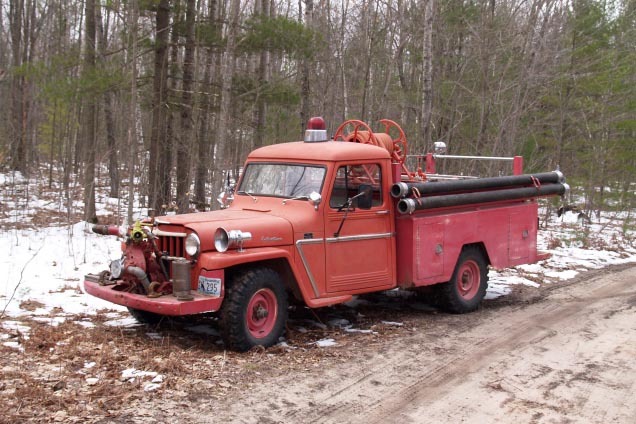 Return to More Willys Fire Trucks. See also Wilkes-Barre Pumper 4, a Valley Fire Truck FC-170. 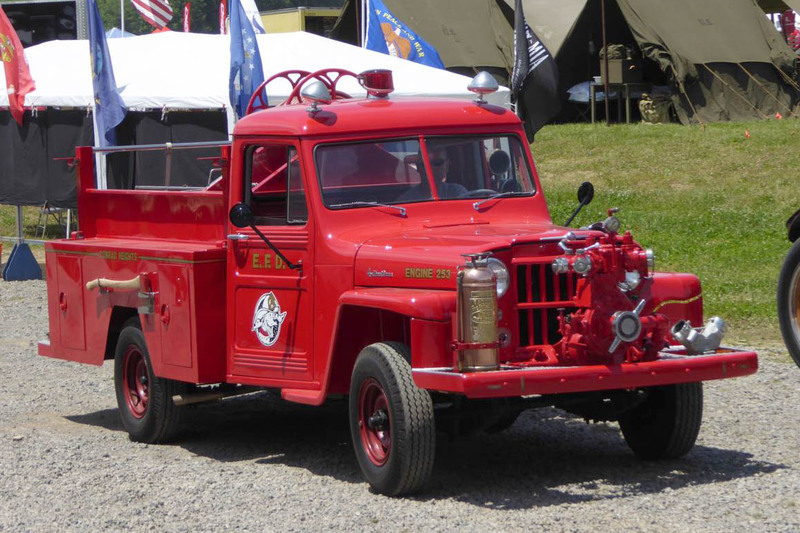 See more Fire Service Jeeps on CJ3B.info.